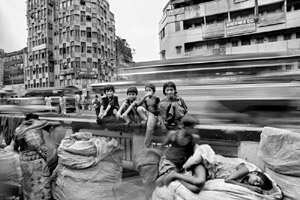 Raghu Rai’s photograph of street children. In June, Child Survival India, a New Delhi-based NGO, organized photography workshops for underprivileged children in the age group of 10-19. These workshops were attended by around 40 boys and girls, including school dropouts and those who have never been to school. Apart from the works of the children, professional photographers and artists have donated works too. They include Raghu Rai, Dinesh Khanna, Prashant Panjiar, Ram Rahman and Arpana Caur. The key objective of the workshops was to let children explore their creative potential, says Deepa Bajaj, chief executive, Child Survival India. The workshops sought to teach photography as a vocational skill as well as make it an avenue for self-expression. “The children shot everything from portraits of their friends and families to landscapes of their own neighbourhood. Some highlighted the lack of infrastructure in their localities. We wanted children to swim in their own thoughts, chase the horizons of their dreams; look at all the things that were around them—their homes, their families, their friends, their ecosystems and their inter-personal spaces," adds Bajaj. Lightbulb Memoirs is showing at the Academy of Fine Arts and Literature, Siri Fort Road, New Delhi, till 8 October, from 11am-7pm.